It has been quoted that this may be the “Best dive bar in the world”. It has also been said that it is the best dive bar in Los Angeles. I absolutely love this place. 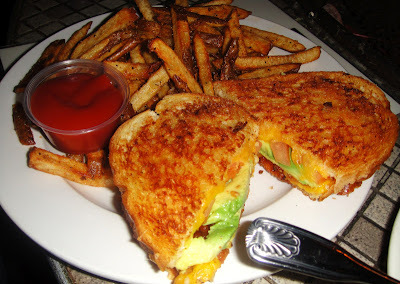 I am not really the “dive bar” kinda gal, but if they have amazing AND cheap food, I will be there in a heartbeat lol. This bar is literally the definition of a “dive bar”- it’s a hole-in-the wall bar in the heart of Culver City- it is always busy, drinks are cheap and they have great food. They have happy hour too, so you can get certain things on the menu for half off. They have a great band that performs at 9:30pm every Wednesday night, and they have karaoke on Thursdays, Fridays and Saturdays. It is definitely a fun and lively bar, and it gets crazy late at night. Highly recommend checking it out if you are around the area! Known for their Mac n’ cheese, I recommend you try this at least once. Very rich in flavor and texture. It’s a good one! Kind of obsessed with this. Such a good grilled cheese and everything is better with avocado and bacon. The garlic fries at Backstage are soooo amazing too! This is comfort food at its best. Highly recommend. I mean, you can’t go wrong. So yummy! Trust me get these fries! The sweet potato fries are also very good too. The burger is good, but too over cooked for me. I loved the house special sauce, similar to In N’ Out’s special sauce. I liked it, but I prefer the Supreme Grilled Cheese over this! Everything I’ve ordered at Backstage has been great. It’s such a fun place!